It’s relatively easy to set a camera on Auto, go to a great location, and start shooting pictures. Becoming a photographer (serious amateur or professional) starts when there is an understanding of light, exposure, and composition. It happens when the camera is taken off Auto, and we start changing the ISO, Shutter Speed and Aperture. We start creating the images from our own experiences, instead of letting the camera’s programing make the choices for us. All of these techniques have different exposures to work with. This combined with the elements included in the frame. The photo below is a Northern Harrier (hawk) soaring. I chose to include the snow-covered mountains at the bottom of the frame, to show some of the environment. The image is cropped in height, to bring focus to the Northern Harrier and the mountain. 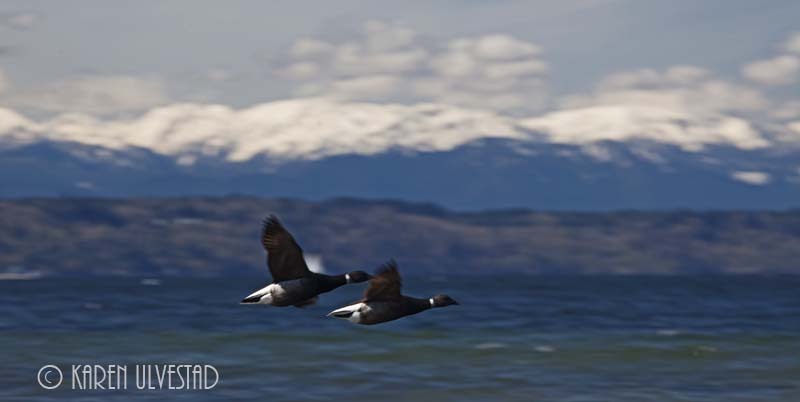 This next image is of two Brant in flight, a relative to Canadian Geese. They migrate south during the winter, and nest above the Arctic Circle. This is a winter shot, and the Olympic Mountains are in the background. The background is soft in this image, because I chose a slower shutter speed (1/250 sec), and panned with the birds. They fly very fast. Again, I cropped this one in height to draw attention to the birds and their environment. By panning, I blurred any man-made structure on the other side of the water. There are houses there, and they have blended into the surrounding trees. This last image is taken with a larger Aperture. I wanted to show the streams path, waves, and the birds. These are Bonaparte’s Gulls, Mew Gulls and Glaucous-winged gulls. The lines from the stream start in the fore-ground, and lead the eye towards the birds. The waves in the background add a “back” to the photograph. I cropped this in height to show the birds. This is a story about slack-tide on Puget Sound. It is the time the birds gather on the beach, bathe, and drink fresh water. I enjoyed reading the post and viewing your photos, thanks! Thank you Phil. . .